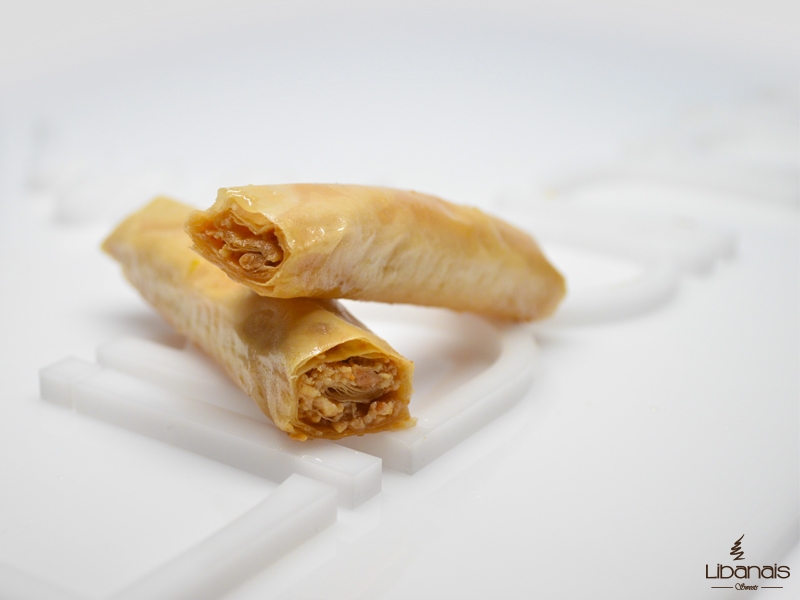 The world’s finest cashews crushed inside our secret phyllo dough rolled in the shape of fingers. Asabi is one of the lightest Mediterranean sweets pieces. It is love at first bite; you’ll almost bite your fingers. Wheat flour, cashews, sugar, ghee, salt. Asabi is the pastry of choice for those who prefer a light, not so sweet, dessert. Its small size and moderate sweetness make it great for those who want a sweet treat without the extra calories. It is one of the crunchiest and lightest among all pastries. It is usually found in different sizes, but the shorter and smaller it is, the better it tastes, the more elegant it looks, and the more difficult it is to make. It takes significant skills to make Asabi that have a small circumference and small size because it is harder to handle the dough and keep it from cracking when rolled into a small finger. Pronounced [ʼa-sa-biʻ], it is the Arabic word for “Fingers”. It got its name because it is rolled in the shape of short fingers. In the western world, Asabi is more widely known by the name “Fingers”. First the phyllo dough and the sugar syrup are prepared, then the dough is filled with nuts, rolled in the shape of fingers, and baked. Asabi (Fingers) are made of phyllo dough. To make the dough, flour, water, and salt are mixed together. The dough is then kneaded extensively to form very thin layers. After each sheet of dough is kneaded in the form of a disk, it is flipped around its diameter using a rod to form a half disk. Then the filling made of raw cashews are added along the long side of the dough. The dough is next rolled over the filling in the shape of fingers with the help of a long rod. Finally, the long fingers are cut into the desired finger size. The finger shaped cylinders of nuts filled dough are placed on a baking sheet and topped with ghee. The Fingers are baked on high temperature for about one hour after which the remaining ghee is drained. Hot sugar syrup is added and the dessert is left to cool. Asabi constitutes a relatively light dessert and thus the perfect dessert after a heavy meal. It is usually served as part of assorted Baklava arrangements. Asabi is popular in most Arabic and Middle Eastern countries. Because it is easy to make and requires relatively less skills if rolled into thick fingers, it has gained worldwide reach and popularity. Asabi is one of the Assorted Baklava pastries that is made with phyllo dough. Assorted baklava pastries are made of two forms of dough: Paper thin sheets of phyllo dough and thin strings of dough called knafeh dough. Asabi takes advantage of the thinness of the dough that enables it to be rolled over many layers to form the shape of elegant fingers.